Dr. Paritosh Gogna comes with an experience of more than 10 years in the field of Orthopedics. He completed his MS (Orthopedics) from DMCH, Ludhiana, Punjab. 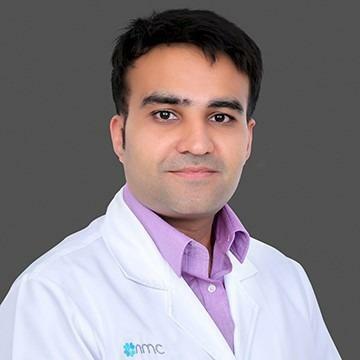 He then went on to work at PGIMS as Senior Resident and then Consultant Orthopedic Surgeon and was associated with Artemis Hospital Gurgaon as Consultant Orthopedics. He has received his advanced training in Shoulder and Knee Surgery from the finest centers in Europe and India. He attained his DNB (Orthopedics) from National Board of Examinations, New Delhi in 2012 and was awarded Dip. SICOT by International Society of Orthopedics and Trauma Surgery, Belgium in 2013. The Indian Orthopedic Association conferred upon him IOA-WOC fellowship in 2015 and IOSUK fellowship in 2016. Having learned the art of Knee Replacement from Medanta, Medicity, Gurgaon, he went Europe to chisel his skills in shoulder surgery. He undertook Clinical Fellowship in Shoulder and Elbow Arthroscopy and Arthroplasty, at D’Cervesi Hospital, Cattolica, Rimini, Italy. Thereafter he went to complete his Fellowship in Shoulder Surgery, at OLVG Hospital, Amsterdam, Netherlands. He has been trained at the finest centers in the United Kingdom (Royal Devon and Exeter hospital, Exeter and Wrightington Hospital, Wigan). He has to his credit more than 50 research publications, which find their place in the most eminent journals of international repute including Bone and Joint Journal, Archives of Orthopedic and Trauma Surgery, Journal of Knee surgery and International Orthopedics to name a few. He has contributed chapters to various Orthopedic books. He has presented 38 papers at National and International Conferences and has given lectures on National Television for the training of DNB Residents. He has expertise in managing sports injury and degenerative conditions of shoulder and knee including but not limited to Arthroscopic Bankart’s Repair, Rotator Cuff repair, ACL / PCL reconstruction, Total Shoulder Arthroplasty, Reverse Shoulder Arthroplasty and Total Knee Replacement.